It’s December, and we’re coming up to the gift-giving season. In case you want to put something professionally relevant on your wish list—or, perhaps more realistically, in case you haven’t yet spent your 2010 book-buying budget—I’m going to devote this column to books. Specifically, books on form design. I admit that I am co-author of one of them, but I’m going to try to be as objective as possible. If you’re a forms geek, you’ll want all of them. Not a forms geek? Read on, and I’ll try to help you pick out the ones that are most relevant to you. The newest of these five books is Borries Schwesinger’s The Form Book: Best Practice in Creating Forms for Printed and Online Use, published in 2010 by Thames and Hudson. This is the English edition of his German book Formulare Gestalen, which Verlag Hermann Schmidt Mainz published in 2007. However, it’s not just a translation; nearly all the examples of forms are in English. It’s a massive book: 324 pages on heavy paper, A4 sized – a bit taller and narrower than letter-sized. It’s definitely a coffee-table book rather than something you would want to haul along on a commute. Borries is an information and communication designer, coming from a graphic design tradition. Thus, his book is mainly about what looks good in form design, and it is lovely to look at, with striking use of full-page, full-sized illustrations of many different types of paper forms – and some digital ones. If you want visual inspiration, particularly for paper forms, then buy this book. The book includes a short bibliography, but no references. 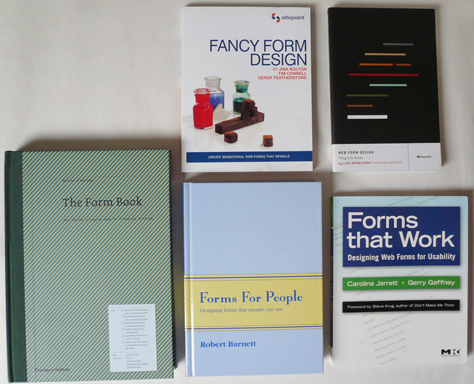 The most comprehensive of these five books is Robert Barnett’s Forms for People: Designing Forms That People Can Use. This is the second edition of the book, published in 2005 by his business, Robert Barnett and Associates, of Canberra, Australia. Robert Barnett was a leading Australian forms designer and educator for over 40 years until his death in 2009. He always championed the importance of ‘useability’, sticking firmly to the spelling that was preferred in Australia until quite recently. Robert’s professional work was primarily with government and large corporations in Australia. A typical recent project for him would have been persuading a government client to rethink and redesign a complex, multipage paper form, including making an electronic version. If you’re working with paper forms, this is the book to buy. Electronic forms don’t appear until page 396; web forms barely at all. The two previous books were mostly about paper forms. What about books on web forms? Well, chances are that you already know about or, possibly, already own, Luke Wroblewski’s best-seller Web Form Design: Filling in the Blanks, which Rosenfeld Media published in 2008. Luke wrote this book when he was working at Yahoo! It also draws on his experience at eBay. Because it’s about Luke’s practical experiences, it doesn’t have a bibliography or references. The heart of this book is how to improve the design of web forms, and specifically, the finer details of interactions with web forms. For example, he has a whole chapter on where to put the buttons, which he calls actions, and another chapter on label placement. This book comprises a slim 226 pages and is also available in an electronic edition. If you’re designing forms that are part of a well-designed website and a well-understood process – such as account creation, contact us, or ecommerce checkout – this is the book to buy. The next book on our forms bookshelf also focuses solely on web forms: Fancy Form Design: Create Sensational Web Forms That Sparkle, by Jina Bolton, Tim Connell, and Derek Featherstone, which SitePoint Pty Ltd published in 2009. This is the slimmest of the five books, at 151 pages, and the authors have devoted many of these pages to extensive code examples. The book takes you step-by-step through how to achieve a variety of effects in your web forms, such as background gradients within the boxes. Unusually, for a coding book – and I suspect because of Derek Featherstone’s influence – there’s advice throughout on coding for accessibility. As you might expect, this book focuses on the practical, so doesn’t provide a bibliography or references – apart from a few useful links. If you’ve already decided on your form’s fields and layout and want specific coding advice on how to achieve particular effects in web forms, buy this book. And now to the book that’s trickiest for me to write about, Forms That Work: Designing Web Forms for Usability, by Caroline Jarrett – yes, that’s me – and Gerry Gaffney. Morgan Kaufmann/Elsevier published our book in 2008. Without much literature available at that time, our biggest challenge was trying to decide what we thought worked as practical advice, then making sure it really did work when we tried applying it – both in our own practice and when other people followed our advice. That took several years and resulted in hundreds of pages of material. Our next biggest challenge was cutting that material down to the 200-page limit we had set for our book – and we succeeded: it’s 199 pages. That’s also why our book focuses on web forms – the more specialised material on paper forms simply had to go. However, both Gerry and I had worked with paper forms before the web came along, so you’ll find that many of our ideas also apply to paper. What does our book offer that Luke’s book doesn’t? Well, it’s got cartoons for a start. But more seriously, it provides models for thinking about forms – such as our core concept of a form as relationship, conversation, and appearance. If you want ideas about things like whether you need a form in the first place and how to think about forms in general, please buy our book. If you’d like to sample the content and style of these books before you invest in them, here are some options for experiencing what they offer. So, which of these books is right for you? If size alone is your criterion, the image shows all five books, stacked from largest to smallest. If you want visual inspiration, particularly for paper forms, read The Form Book: Best Practice in Creating Forms for Printed and Online Use by Borries Schwesinger. If you’re working with paper forms, make the effort to track down Forms for People: Designing Forms That People Can Use by Robert Barnett. If you’re designing forms that are part of a well-understood process – such as account creation, contact us, or ecommerce checkout – read Web Form Design: Filling in the Blanks by Luke Wroblewski. If you’ve already decided on your form’s fields and layout and want specific coding advice on how to achieve particular effects, read Fancy Form Design: Create Sensational Web Forms That Sparkleby Jina Bolton, Tim Connell, and Derek Featherstone. If you want concepts and models that help you to think about forms in general, please read Forms That work: Designing Web Forms for Usability by me, Caroline Jarrett, and Gerry Gaffney.